We have all been there, sitting around the kitchen table talking about nozzles. The classic argument was solid bore vs. combination nozzle for aggressive interior fire attack. There were always lots of opinions supported by years of experience; they always ended with a favorite method and a description of the “only right way to extinguish the fire.” The right way, however, is what works in your community with your engine company system, your engine, your lines, your nozzles, and your members. An important factor that always comes up during these discussions is nozzle reaction. This article presents a simple, efficient, and cost-effective method for an engine company to measure nozzle reaction and to demonstrate it during training or nozzle testing. Measuring and verifying the characteristics of nozzle reaction are an important part of your department’s nozzle-selection process, as nozzle reaction will affect your engine company’s effectiveness. 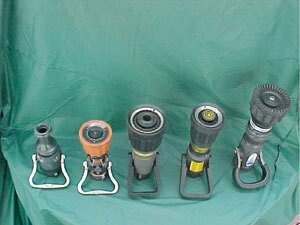 Left to right: a 15/16-inch smooth bore nozzle that flows 180 gpm at 50 psi nozzle pressure, a low-pressure combination nozzle that flows 150 gpm at 50 psi nozzle pressure, a combination and smooth bore nozzle that flows 95 gpm (fog) at 50 psi and 180 at 50 psi nozzle pressure (smooth bore), a combination nozzle that flows 175 gpm at 75 psi, and an automatic that flows 50 to 350 gpm based on available volume and pressure. Nozzle reaction varies with flow and nozzle pressure. Nozzle testing and evaluation are more important now than ever. There are a variety of nozzles and recommended operating pressures and flows from which to choose. As we all know, nozzle reaction is a major factor in how fast the attack team (nozzleman and backup man) become fatigued, causing them to become less aggressive and ultimately to cease the attack. More fatigue means faster respiratory rates and less time your SCBA will last. In these days of three-person engine companies, the endurance of the attack team can make the difference between life and death for truck company members searching above or close to the fire area. It may also mean the difference between a civilian life or a building saved or lost. Putting out the fire is our most important, basic, and critical play-we must have it fine-tuned and do it right, consistently every time. Other members’ lives depend on our ability to control or extinguish the fire. It is likely that we are stuck with understaffed engine companies (this is not a consent or concurrence; it appears to be a fact more often than not across America), so it is imperative to maximize the performance of our equipment and members. Until recently, we had only two basic nozzle choices, smooth bore and combination. Automatics further dazzled us and also became widely used. For the most part, they were designed to operate at 100 psi. In effect, if it was a smooth bore nozzle, you got 50 psi at the nozzle; a combination got 100 psi after friction loss and elevation losses. Recently, low-pressure combination (50 and 75 psi) and low-pressure automatics have added yet another dimension and option to the nozzle-selection process. Nozzle reaction (NR) depends on how much water is flowing and at what pressure the nozzle is operating. Here are two simple theoretical calculations. Add a piece of construction-grade plastic sheeting under the hoseline from where it contacts the ground and back about 10 feet. This fish scale device is quite accurate for measuring and demonstrating nozzle reaction. The measured nozzle reactions are very close to the theoretical calculations above. An in-line pressure gauge installed at the nozzle helps verify that the correct nozzle pressure is being discharged. As we see in the nozzle reaction calculation, the amount of water discharged greatly affects nozzle reaction. As Jay Comella so perfectly described in his article, “Planning a Hose and Nozzle System for Effective Operations” (Fire Engineering, April 2003), you must correctly establish your target flow. Comella boldly challenged his department’s engine company procedures and showed they were not flowing adequate amounts of water. Improvements were then made that increased the safety and effectiveness of the engine companies. When measuring or considering the effect of nozzle reaction on your firefighters, first establish your target flow. Then, you can measure and demonstrate the nozzle reaction. As a general rule, the Fire Department of New York uses this observation to evaluate flow: If one firefighter can handle the line, it is likely not flowing enough water. A target flow of 180 gpm, even from a smooth-bore nozzle operating at 50 psi, has a considerable nozzle reaction that makes it almost impossible for one person to operate and advance. For the solid-bore nozzle, the bore size determines the flow, assuming the nozzle is operating at the correct pressure. Consider the effect of flow on nozzle reaction for all types of nozzles. If the nozzle is not discharging the target flow you have established, it will be evident by how easy the nozzle team can handle the line. Initial attack lines flowing the recommended 180 gpm and being advanced under realistic conditions should demand a fair amount of obvious physical effort by the nozzleman and backup man. Firefighters are a hands-on lot, and providing a visual, realistic display makes it easier to understand and evaluate nozzle reaction. Measurements and displays also take some of the mystery and theory and subsequent opinions out of topics like nozzle reaction. Measurable, demonstratable facts will replace inaccurate philosophizing by department members. Being able to measure and demonstrate these facts puts your engine company in the technical and scientific realm. Engine company work demands an understanding of these basic engineering principles. We developed this simple test apparatus to demonstrate nozzle reaction differences for our FDIC hands-on engine company station. The scale is a heavy-duty fish scale we obtained from our local sporting goods store. Add a piece or two of webbing and a couple of secure posts, and you have a low-cost and surprisingly accurate nozzle reaction measuring and demonstration device. It is important to note that this test apparatus can be used on whatever nozzles, hose sizes, and pressures/flows your department uses. It is another tool to help you fine-tune your engine company operations. We have used this test apparatus successfully to demonstrate differences in nozzle reaction for training and in the nozzle-selection process for several engine companies. It is difficult to judge differences in nozzle reaction by members’ simply holding the line. Muscle fatigue and differences in size, stature, ability, and technique are variables that are impossible to overcome for adequate testing. The direct reading scale will show the relationship among nozzle reaction, flow, and pressure. You may have noticed that we did not supply nozzle reaction numbers and recommendations for determining which nozzles you should use for aggressive interior fire attack operations. You can calculate them or refer to the charts most nozzle manufacturers include in their catalogs. Factors such as available personnel, target flow, hose size, cost, and fire hazards must be evaluated when selecting a nozzle for your engine company. Nozzle reaction is one of these considerations. We have provided a theoretical and a practical means for testing it yourself. What is appropriate in one community may not be appropriate or a safe means of fire attack in another. Nozzle reaction, target flow, and nozzle pressure are tradeoffs you make when designing your fire attack system. Although this method is much less accurate than a scientific or an engineering technique, it is a cost-effective method any department can use to refine its engine company operations. JERRY KNAPP is a training officer at the Rockland County Fire Training Center, Pomona, New York, and a 30-year veteran firefighter/EMT with the West Haverstraw (NY) Fire Department. He has an associate’s degree in fire protection technology, is a former paramedic, and is the emergency management officer at the United States Military Academy, West Point, New York. CHRISTOPHER FLATLEY is a 16-year veteran of the Fire Department of New York, where he is a lieutenant assigned to Ladder 21 on Manhattan’s West Side. Prior to his promotion, he worked in Ladder Company 2 in Midtown. He has an associate’s degree in fire science and is a nationally certified fire instructor I. He is an instructor at the Rockland County Fire Training Center Pomona, N.Y., and has presented at FDIC. TIM PILLSWORTH is chief of the Winona Lake Engine Company in Orange County, New York, and a 19-year veteran firefighter/ EMT. He is employed as a civil engineer at the United States Military Academy, West Point, New York.